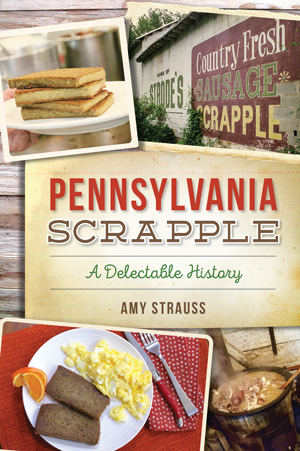 An essential food in Mid-Atlantic kitchens for hundreds of years, scrapple is the often-overlooked king of breakfast meats. Developed by German settlers of Pennsylvania, the slow food byproduct was created to avoid waste in the day's butchering. Pork trimmings were stewed until tender, ground like sausage and blended with the originating broth, cornmeal and buckwheat flour. Crispy slabs of scrapple sustained regional ancestors through frigid winter months and hard-worked harvests. Today, companies such as Habbersett and Rapa still produce scrapple as new generations of chefs create exciting ways to eat the staple. Join author Amy Strauss as she traces the sizzling history and culture of a beloved Pennsylvania Dutch icon. Amy Strauss is a food and drink writer and editor living in Philadelphia. With a knack for uncovering the beauty in all things delicious, she takes to the streets of the City of Brotherly Love and beyond to discover its stories and relay them to you on a silver platter. With a decade of publishing experience in print and online publications for outlets like Philly Beer Scene, Edible Philly, the Spirit News, the Town Dish, Main Line Today magazine, Southwest Airlines, OpenTable, BlackBook, Philadelphia City Paper and Drink Philly, among others, she's hungry, she's eager and she loves to have her cake (and eat it, too). Beyond food and drink journalism, Amy is experienced with building creative content for brands like Campbell Soup Company, Victory Brewing Company, Iron Hill Brewery & Restaurant, Garces Group, Airgas and more. She's obsessed with her Pennsylvania Dutch heritage, slices of funfetti cake and not giving up hope for the Philadelphia 76ers. Follow her ongoing culinary pursuits on Instagram at @amystrauss or online at www.amystrauss.com.